"Mysore Sandal Soap is a brand of soap manufactured by the Karnataka Soaps and Detergents Limited (KSDL), a company owned by the Government of Karnataka in India. This soap has been manufactured since 1916 when Nalvadi Krishnaraja Wodeyar, the king of Mysore set up the Government Soap Factory in Bangalore. The main motivation for setting up the factory was the excessive sandalwood reserves that the Mysore Kingdom had which could not be exported to Europe because of the First World War. [ In 1980, KSDL was incorporated as a company by merging the Government Soap Factory with the sandal oil factories at Shimoga and Mysore. 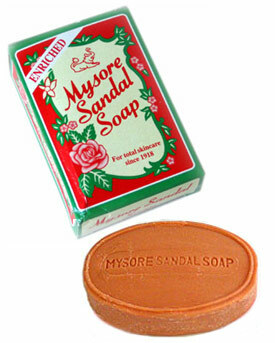 Mysore Sandal Soap is the only soap in the world made from 100% pure sandalwood oil. KSDL owns a proprietary Geographical indication (GI) tag on the Mysore sandal soap which gives it intellectual property rights to use the brand name, to ensure quality and also prevent piracy and unauthorised use by other manufacturers. In 2006, Mahendra Singh Dhoni, the Indian cricketer was selected as the first brand ambassador of the Mysore Sandal Soap."